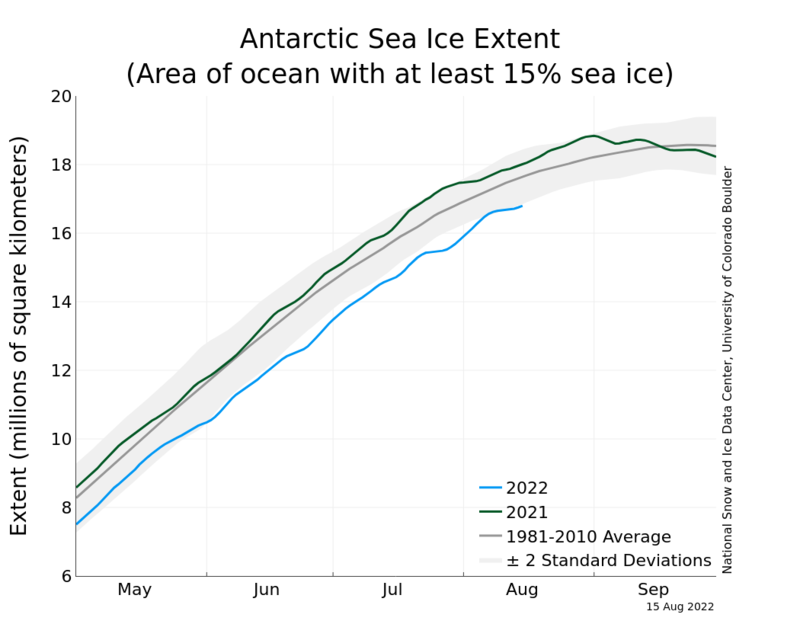 In early 2019, the Arctic, Antarctic and Global Sea Ice Area Extent were each at or near the lowest level in the data set. In the past, recovery of all took place over the summer, for example, with the Antarctic getting back within 80% of observations by late September 2017 and Arctic nearly so. Context: the average Antarctic ice area for the date is about 13.049 million sq. km. The Special Sensor Microwave Imager and Sounder (SSMIS) on the Defense Meteorological Satellite Program (DMSP) F-17 satellite that provides passive microwave brightness temperatures (and derived Arctic and Antarctic sea ice products) has been providing spurious data since beginning of April, 2016. The data showed a steadily rising ice amount over the 1979 to April 2016 period. (Source: Department of Atmospheric Sciences at the University of Illinois). This is no longer published. The National Snow and Ice Data Center chart on the right shows a rising sea ice trend over the available data from 1980. There were 3 years starting in 2012 with rapid rises immediately followed by 3 with rapid declines bringing the extent to slightly below that of 1985. The National Snow and Ice Data Center shows a map-based view. 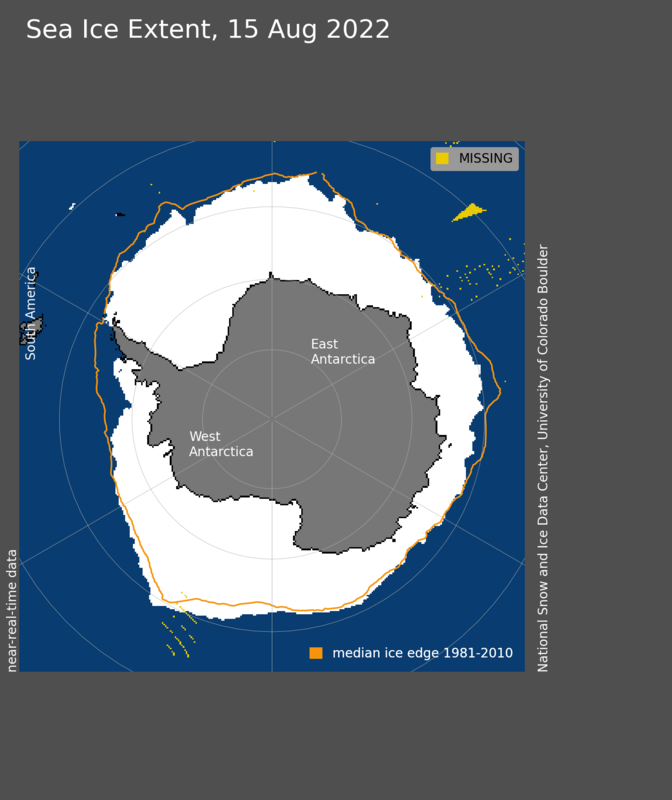 After a reaching its maximum extent unusually early and then following a period of relatively unchanging overall extent, Antarctic sea ice extent started to decline in earnest in mid 2016. Daily sea ice extent levels have been at second lowest in the satellite record since October 2016 and at a new low in January 2019 and below the two standard deviation range. 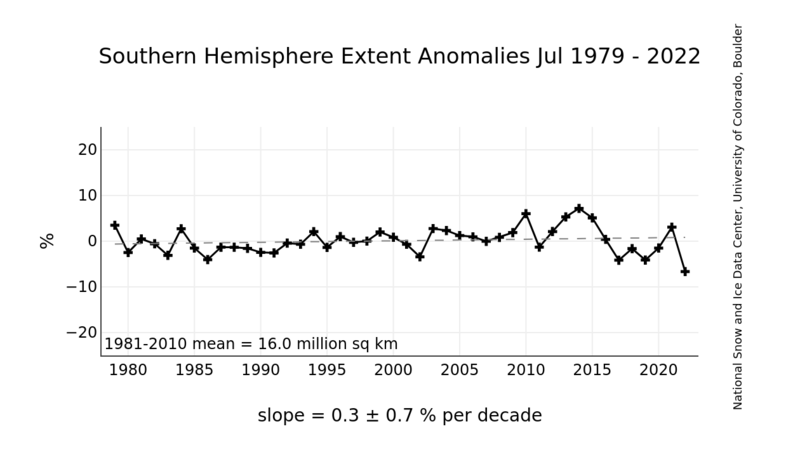 The longer term trend line shows a 1% rise perdecade in ice extent over all available data (since 1979). Both of these figures are from the Center. Analysis: Conventional wisdom (and the IPCC) states that the poles will warm first. But there is no change in the Antarctic. What does this tell us? The Antarctic alone cannot be used as an indicator of warming or cooling, because it must be viewed in concert with the Arctic. Also, data only goes back to 1979, when satellite sensors and analytical programs could get a handle on measuring sea ice. Even today it has problems, such as dealing with water on ice, as happens after a warm spell. The sensor sees water, not ice, but this does not mean the underlying ice is gone. 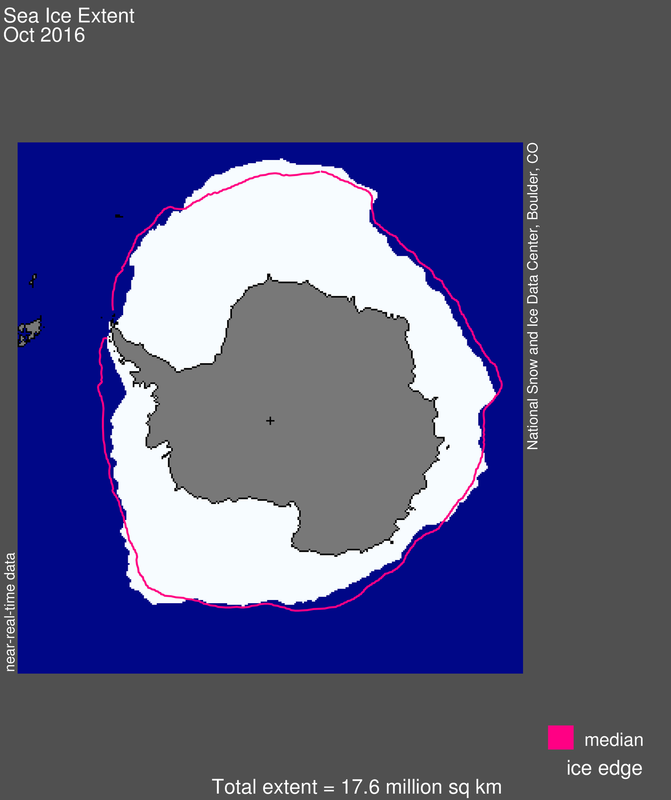 If the Antarctic gains or loses ice, but the global balance is about the same, there is no global cooling or warming. The convoluted arguments made by CO2-based modelers to rationalize the failure to predict or reflect what is so visible to both the trained and untrained eye instigates ridicule and has weakened their credibility among both legislators and the public. More importantly, we must wonder what the satellites would have observed happening in the Antarctic when Roald Amundsen sailed through the Arctic in 1903-1905 on the small wooden ship Gjøa when the Northwest Passage was open to sailing vessels, and again in 1940-42 and 1944 (St. Roch), it is possible the reduction in Arctic ice is not an indicator of warming, since it was balanced by record high Antarctic ice levels and a rising trend line for the data set since 1979. The return of Arctic sea ice to more normal levels in late 2017 and Antarctica remaining generally above the average has received little attention.